The community of Victorville was incorporated on September 21, 1962, as a general law city with a population of approximately 8,111 and an area of 9.7 square miles. As of January 1, 1995 the City's population and area was 60,648 and 67.68 square miles respectively. These figures indicate the City has grown substantially in its history as a municipality. Prior to incorporation the community had a history which goes back over 100 years, when the first settlers of European descent arrived. In about 1885, the community was known as Victor. It was named after Jacob Nash Victor, a construction superintendent for the California Southern Railroad (Santa Fe Railroad). 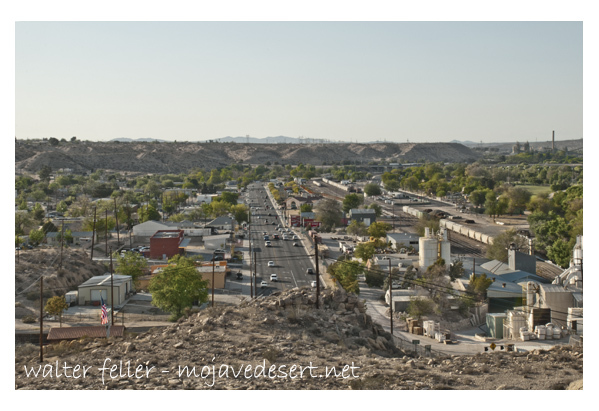 The town was established as a result of the original railroad station constructed approximately one mile northwest of the Mojave River narrows. On January 18, 1886, the Plan of the Town of Victor was prepared which created the grid pattern of the original town. This original subdivision included property between "A" Street through "G" Street and First Street through Eleventh Street. The area encompassed approximately 200 acres or one-third of a square mile. The abundance of good water and the availability of rich bottom lands led to agricultural development shortly after the establishment of the railroad depot. Near the turn of the century, large deposits of limestone and granite were discovered. Since then the cement manufacturing industry has emerged as the single most important industry of the Victor Valley. In 1901 the community's name was changed by the United States Post Office from "Victor" to "Victorville" due to the confusion associated with the community of Victor, Colorado. In 1926, U.S. Route 66 was established, which was one of the main arteries of the National Highway System linking Chicago, Illinois, with California. A portion of this famous highway provided a transportation corridor through Victorville, which was unsurpassed until Interstate 15 was constructed. Seventh Street and "D" Street were a part of this national highway. A brief history of the Victor Valley.